The valves are made from high quality body and bonnet castings with liberal sections. The valves of bigger size and higher pressure are provided with thrust bearings and with gear drive arrangements. The seat ring uses the floating seat ring structure with o-seal ring sealed and pre-tightening force applied to have inlet and outlet dual-way sealed; and the open- close moment with this structure is 1/2 that of the Common valves only, able to lightly open and close valves. The seat ring uses the sealing face inlaid with PTFE, so has dual seals of PTFE to metal and metal to metal, the PTFE sealing face also acts as removing the dirt on the wedge disc. For the valve with the metal to metal seal, there is grease injector outside of it, grease gets into the sealing face through the injector and the seat ring to have the valve up to null leak. The wedge disc of the valve with flow guide hole is always fitted with the sealing face whether in full open or full close status to have the sealing face protected without being directly eroded by the medium so as to extend the duration. 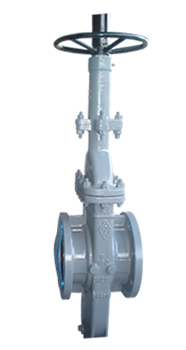 When fully opened, the valve’s channel is smooth and linear, with an extremely small flow resisting coefficient and no pressure loss, and the pipeline can be cleaned with hair-ball through it. This valve uses the packing structure with the ability of self-seal, needs no constant adjustment, features very light open and close and reliable seal. An assisting sealing grease injection structure is set in the packing to have the sealing performance absolutely reliable and get a true null leak, settling the problem for the packing place of universal valves to be easiest leak outward. Automatic removal of the high pressure in the internal cavity when the valve is about to close so as to ensure safety. Fully sealed structure leaves a good protective properly, suitable for the requirement of 24 hour duty. An indication rod or viewing window is set with the valve to show the open-close condition.